All the Nutrients in Moringa Oleifera Leaf Powder Capsules are BIO-CHELATED which means they are in their natural form as part of the leaves cellular structures and is therefore most suitable for absorption and utilization by the Human Body. Moringa is a wonder plant which is regarded with great respect in the world of medicine. Every part of this plant can be used for healing purposes. Organic Veda brings to its consumers the benefits of this plant in the form of Moringa capsules. Moringa capsules contain the essence of this plant packed in a healthy, well-researched dosage. Moringa is rich in vital nutrients like vitamin A, B, C and minerals, antioxidants, protein, etc. Our organic Moringa capsules are produced in a way that preserves the maximum portion of these nutrients. Organic Moringa capsules are a great food supplement which keeps energy levels high throughout the day. Organic Veda’s Moringa Oleifera capsules are 100% genuine and natural, and contain no artificial ingredients. In fact, our range of Moringa products varies diversely to cover the Best Moringa powder, oils, tea, etc. Buy organicveda Moringa products today! ALL NATURAL High Potency Raw Super Food Supplement. High Essential Nutrients. POTENT MORINGA leaves grown by ethical organic farming and PROCESSED at best by EXPERTS. Contains 20 types of Amino acids, 46 types of Antioxidants,90+ Nutrients, great source of Bio-available Vitamins and Minerals like Vitamin A, Vitamin B, Vitamin B1, Vitamin B2, Vitamin B3, Vitamin B6, Vitamin C (Ascorbic Acid), Vitamin E, Macro Minerals and Trace Minerals. Additionally, We do have Moringa Leaf Powder 300 Veg Capsules. 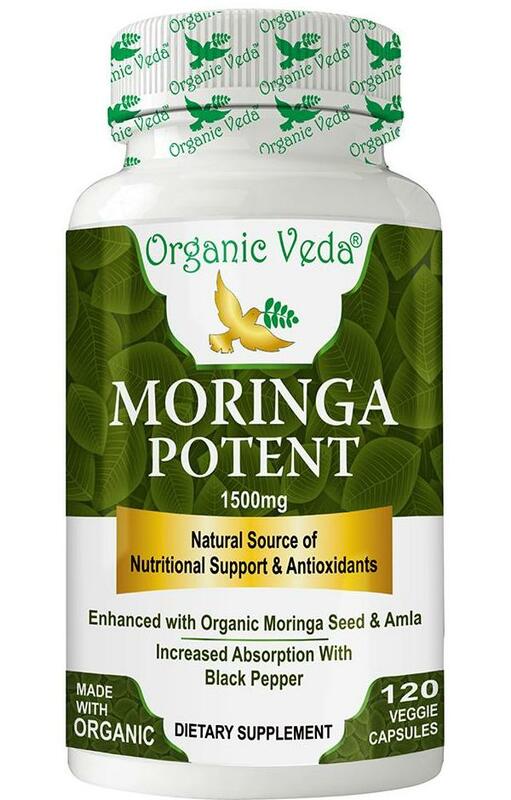 To View, please click here for Moringa Capsules. 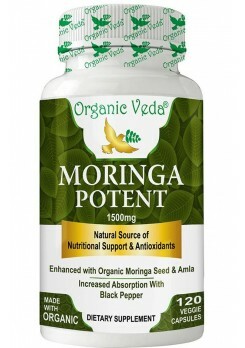 Buy your Moringa Leaf Powder Veg Capsules today! We currently have no information for moringa capsules side effects and Interactions with food or medicines. However, Before using Moringa Capsules, pls consult your healthcare professional.